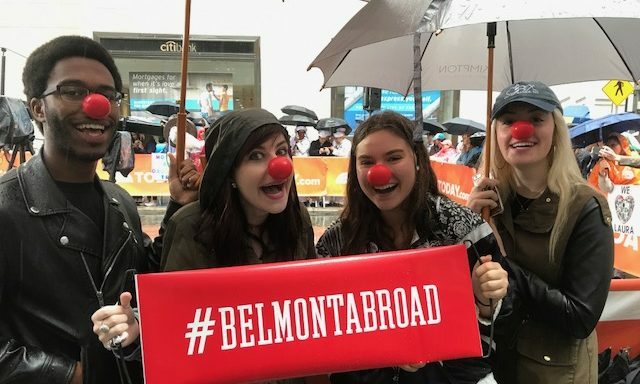 The Belmont in New York City Maymester program centered on “Talent Buying and Concert Promotion Strategies,” focusing on the business of buying, booking and selling entertainment. The course, which was full with 11 students, involved an in-depth, real world look at tour routing, offers and contracts, negotiating deal points and riders, promoting and producing live events, and show settlement. Industry experts explained contract provisions including indemnification, breach, liability and force majeure. They also discussed the financial positions of the varied stakeholders. As part of the six hours of earned credit, students had an opportunity to talk with top booking agents, concert promoters and venue executives during the course of the class. The students also participated in a number of NYC-centered activities during their off time, including watching a Yankees game, visiting art museums and appearing on the TODAY show broadcast from the plaza outside the studio on Red Nose Day.